Spark Festival. Regis Art Center. tectonic industries, Perhaps this is the only way of knowing if anything was ever important to you. For one week each year, the Spark Festival gathers creators and performers of new media arts from around the world to the Twin Cities of Minneapolis/St. Paul, USA, to showcase their work to the public. Art(ists) On the Verge is an intensive, mentor-based fellowship program for Minnesota-based, emerging artists or artist groups working experimentally at the intersection of art, technology, and digital culture with a focus on network-based practices that are interactive and/or participatory. This is the second round of Art(ists) On the Verge grants, which are generously supported by the Jerome Foundation. Arlene Birt, Kyle Phillips, Tyler Stefanich , and tectonic industries are presenting their Northern Lights.mn supported projects for Art(ists) On the Verge at the 8th Spark Festival of Electronic Music and Art, which opened Wednesday, September 29. The project was going to be displayed as a proof of concept at a local store but last minute technical difficulties at the partner store prevented this. 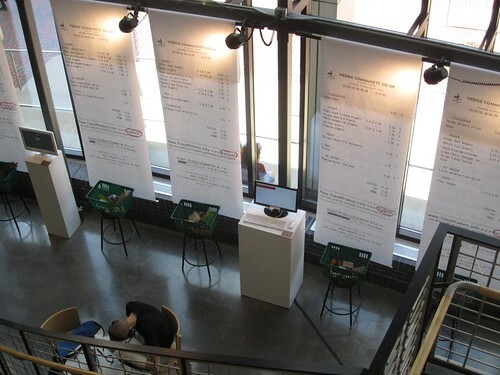 In the Regis Center, blow ups of sample “receipts” are displayed along with their corresponding basket of groceries. Via a kiosk, viewers can enter product IDs and review a visualization of the “localness” of the products. To try this online, go to http://traceproduct.appspot.com/ and enter any of these codes: 1a2b3c, 4d5e6f, 7g8h9i, 1x2y3z, or 4x5y6z. Kyle’s original Art(ists) On the Verage proposa l for “Empathetic Architecture” stated “I would like to create an empathetic space, which explores the network and relationship between itself and the people that inhabit it.” In part, the past 9 months have been spent understanding just how difficult it is to create a successful and compelling responsive architecture. Kyle’s installation in the Regis Center has at least 3 components. 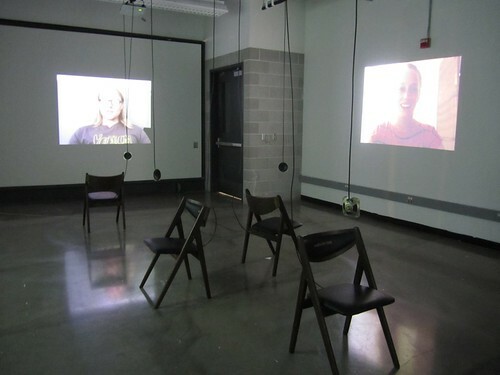 A shotgun microphone in the gallery captures conversations and sound in a very localized part of installation. These sounds are played back after an offset by speakers at the entrance to the room as a kind of attract sequence. Once inside, the viewer inevitably moves toward a shrouded space with a projection surface, which alternates between a grid of faces previously inhabiting the space and a real-time overlay of one of those faces and yours, as you gaze at the projection. Finally, projected spots on the floor indicate the “weight” of where the most people have stood, and a faint glow follows you one the floor as you walk around. Each of these reactive elements of the installation remind you of all the others who have been through the installation, also trying to figure it out. tectonic industries, Perhaps this is the only way of knowing if anything was ever important to you. tectonic industries (Lars Jerlach and Helen Stringfellow) are endurance artists–although that’s probably not how they would describe themselves. Or at least endurance is only part of their practice. For The One Year Project (2007) they cooked one meal a day in chronological order from the Rachael Ray cookery book, “365: No Repeats A Year of Deliciously Different Dinners.” For their AOV2 grant , they proposed “for the duration of 2010, tectonic industries will transcribe from spoken word to text, every new episode of the Oprah Winfrey show and publish the results online every weekday, with summaries posted to Facebook and Twitter.” For this Another One Year Project , tectonic industries creates three versions of each Oprah show. One is not a verbatim transcript, but it is an honest attempt to “report” the entirety of the program. The second version is a distillation into the top 5 lessons learned from the day’s episode. And finally, there is a 140 character Twitter feed of the episode, from which the title of this installation derives. 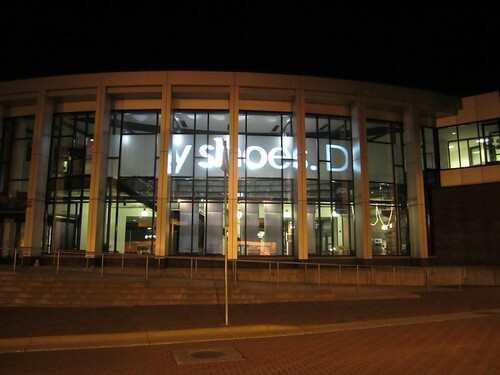 While the project is not yet completed, tectonic industries is streaming across the facade of the Regis Center, the Tweets of the episodes viewed to date.